Printed flags are a visual and striking way to promote your business both indoors and out. Flags printed with your design or branding are ideal for outdoor exhibitions, sporting events, country fairs and festivals. Our Zoom Lite Flags come in a range of shapes and sizes. Teardrop Flag, Crest Flag and Feather Flag are all available in 2.8m, 3.4m, 4.5m and 5.6m heights. The Zoom Lite Straight Flag comes in heights of 2m, 3m, 4m and 5m. Why Choose a Zoom Lite Flag? Our flags are printed on a 115g polyester textile using a method called ‘Dye-Sublimation’ printing. Dye-Sublimation is a process where full colour images, text and graphics can be transferred into a material. A special dye-sublimation ink is used which, when heated, changes from being a solid dye to being a gas. As the gas encounters fibres it penetrates and permanently dyes them. The shapes and sizes available for the Zoom Lite flags allow you to select and flag that fits your purpose. 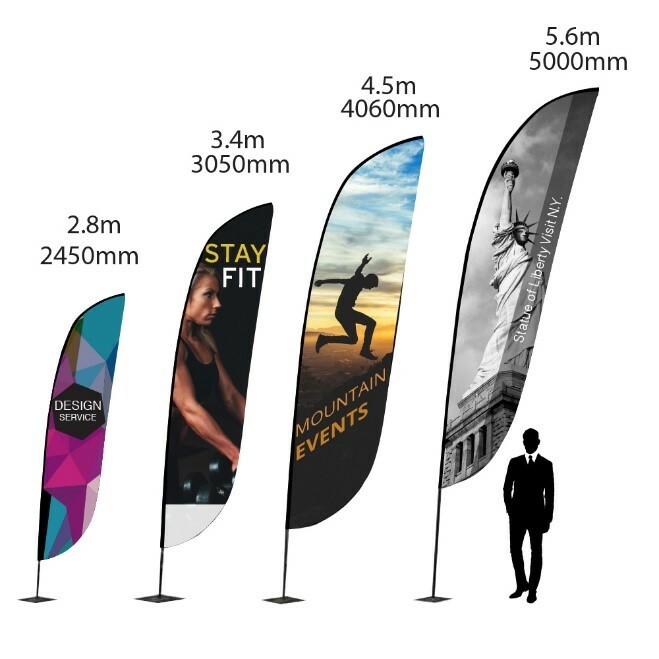 For example if you’re attending a large outdoor exhibition you will want the most brand exposure and so a large flag may be ideal, whereas if you are a retail business then a smaller flag may be more suitable. Due to the range of base options available for each flag, they can be used on almost any surface and are easy to assemble. Different bases are ideal for different applications, for example a water base provides stability to the flag on both hard and soft ground, whilst a flag ground spike is only suitable for soft ground use. Some of the common places that promotional flags are used at include garages, sports events, forecourts, car showrooms and festivals. Zoom Lite flags are lightweight and highly portable allowing for easy transport and storage. An optional carry bag is available that makes it easy to transport your flag long-distances or even internationally. When using a weighted base or a water base, flags can withstand wind speeds of up to 18 miles per hour. Ideal for the British summer weather! Flags can be washed in a regular washing machine on a 30°C wash with everyday detergents, allow your flag to completely dry before storing. To extend the life of your printed flags you can trim, reinforce and re-hem edges. When setting up and dismantling your flag, make sure the material doesn’t catch or snag on its pole or any other surrounding objects. For more information on maintaining outdoor flags please see our “How to Care for Your Flag” PDF. 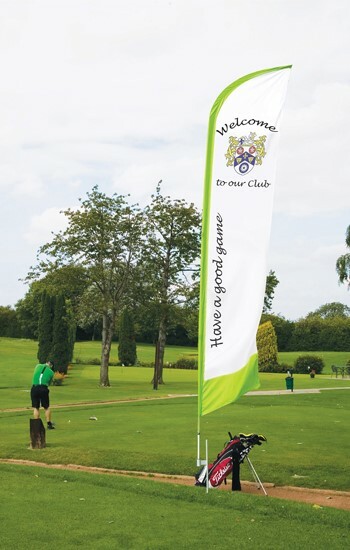 Printed outdoor flags are a cost effective way to get your brand noticed from a distance at both indoor and outdoor events, at a height of up to 5.6m your brand will be hard to miss! Zoom Lite flags start at just £82.00 which is perfect for everyone from first time exhibitors to exhibition veterans. If you need artwork creating for your flag, we offer an in-house, professional graphic design service. One of our designers can create a design that meets your needs perfectly and the final design won’t go to print until you are completely happy with it. For more information about the Zoom Lite Flag range or our Graphic Design Service, please contact us or call our sales team on 01733 511030.